Jordan’s Queen Rania has a mission. She wants to bridge the religious and cultural divides between the Muslim and Western worlds, and she is an ardent advocate for education. To serve her goals she has written a children’s book called “The Sandwich Swap.” where lunch sandwiches — one peanut butter and jelly, the other pita bread and hummus — serve as a metaphor for the differences between two friends from different cultures. The Book touches on such issues as getting to know others, openness and multiculturalism. Doesn’t the book sound wonderful, give you goosebumps, make want to go outside in the rain to kiss your neighbor and sing Kumbaya? It is even published in English for the US, by Disney. There is only one problem with the queen’s message of tolerance, she doesn’t believe in it. According to a report by the liberal Israeli newspaper, Ha’aretz, Jordan’s Queen Kumbaya Rania has refused all offers to have her book to be published in Hebrew for distribution in Israel. Keep in mind that Jordan is one of two Arab states that has signed a peace treaty with Israel (the other is Egypt). Queen Rania of Jordan has turned down several offers to publish a Hebrew version of a children’s book she recently wrote. 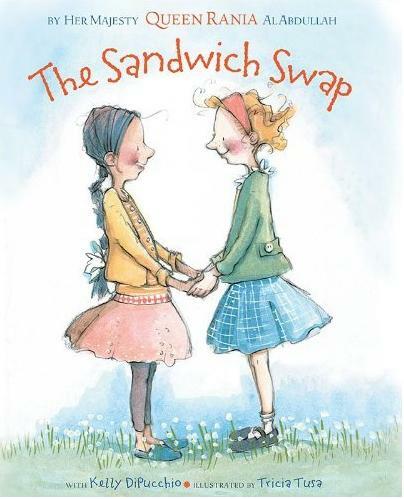 The book, which was published in the United States by Hyperion under the title “The Sandwich Swap” for children between 4 and 8 years old, was co-written with Kelly DiPucchio and illustrated by Tricia Tusa. ….Brisk sales of the book have put it on the New York Times’ bestseller list, and its promotion in the United States has included appearances by the Jordanian queen in television interviews with Oprah Winfrey and Barbara Walters. The book was launched in April with a reading given by Rania at the United Nations. The queen was born into a family of Palestinian origin, and she studied in the multicultural atmosphere of an English-speaking school in Kuwait. In an interview she gave after the book was published, she said the story had been influenced by her own childhood, and that her own mother in fact sent her to school with hummus and pita sandwiches. Queen Rania also described her shock the first time she saw a classmate eating a peanut butter and jelly sandwich. Since 2007, Queen Rania has been working with UNICEF on child welfare issues and as honorary chairwoman of the UN’s effort to promote the education of girls. “The Sandwich Swap” has been published in English and Arabic. The queen’s website notes that proceeds from the sale of the book will go to an organization in Jordan that is renovating 500 schools there. Gee, that is a wonderful message to send the kids, tolerance for everyone except the Jews. Either that or those Jordanian Schools do not need the money. The truth is that even though Jordan has signed a treaty with the Jewish State, they have no desire to be friends with Israel. The only reason the Jordanian King pushes so hard for peace between Israel and the Palestinian Arabs, he fears the Palestinian Arabs. The reason the King rejects the Palestinians is that Jordan is a Palestinian state, that why Jordan has kept the refugees in a ghetto since 1948, and even now refuses to give them citizenship. The population of the country is already mostly Palestinian. In fact until 1967 the west back of the Jordan River was part of HIS country. When the terrorist Arafat was getting too powerful, the Jordanian Army acting on the orders of the previous king, massacred thousands of Palestinian Arabs to get them out of the country. Jordan does not really care about real peace, and the Queens refusal to allow her book to be translated into Hebrew is just one more example.